As you leave the gun shop you’re confused, infuriated and empty-handed. You’ve never committed a crime in your life. You’re a hunter education safety instructor, a father, a life-long sportsmen, a military veteran and are active in your church. Yet somehow a bureaucrat who knows nothing about you claims you’re a mental case. Finally you remember: almost two decades ago, your family doctor sent you to see a “specialist” who prescribed anti-depressants for a temporary bout of depression you were dealing with after your father passed away. In hindsight, the pills didn’t help much and it all seemed so innocent at the time. But that was then and this is now — when law-abiding gun owners get entangled in the nets of the NRA’s new-and-improved federal gun control scheme: NICS. Recently Wisconsin Republican State Senator Alberta Darling (River Hills) announced she will sponsor a post-Virginia-Tech gun control bill in the state legislature. Her bill will dump mental health data at the state level into the federal National Instant Check System (NICS) database. Darling claims these records will be used to disqualify those “adjudicated mentally defective” from buying guns. Darling’s bill is a response to federal legislation introduced by Rep. Carolyn McCarthy (D-NY) — formerly HR 297 which has now morphed into HR 2640, the “National Instant Check System (NICS) Enhancement Act” — which would expand the scope of point-of-sale background checks to survey the new influx of mental health records provided by states. The Federal Department of Justice (DOJ) has issued letters to state attorney generals requesting they voluntarily supply court-held health record data to the feds. So far only 23 states comply with those outlandish demands. 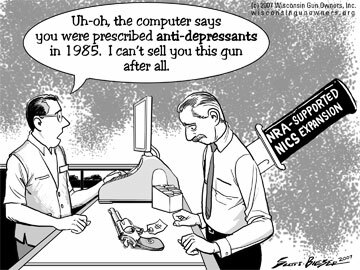 NRA Chief Lobbyist Chris Cox claimed, “We’ve been on record for decades for keeping firearms out of the hands of the mentally adjudicated. It’s not only good policy, it’s good politics,” he said. Not so fast, Mr. Cox. An honest examination of this multifaceted issue reveals that an expansion of NICS buys into a dangerous false premise for all gun owners concerned about their liberty and is not sound policy or good politics for the Second Amendment community or anyone else. Here’s why gun owners must not only oppose expanding the NICS background check system, they must fight to repeal it. I was a life member of the NRA before the enhancement act. I am a Vietnam veteran with mental health problems. My name got entered on the NICS list by Bill Clinton and then by the original (enhancement) Veterans disarmament act. The key word in this argument is “adjudicated”. According to the amendment to the constitution and the 1968 gun control act, rights cannot be taken away from an individual without due process of law. An enactment of a law is not due process. It is my determination that they would have to prove a person incompetent to own a gun in court before a jury if that person wished. My argument with the NRA in my letter to cancel my membership is that almost all mentally ill persons are more likely to be a victim of violence than the aggressor. Many homeless people are mentally ill and their stories don’t make the news but a it’s human nature for a “weak” person to be abused by the socalled normal. I would be willin to fight this issue all the way to the US Supreme Court if I could. 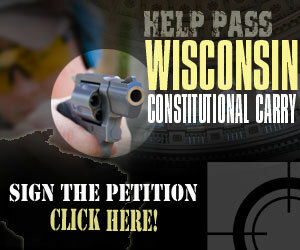 I am not in Wisconsin but I would be willing to support an appeal within my limited means. A doctors record is not a due process Adjudication and the court would have no choice but to rule that way. I thought that the GOA would take it to court but they won’t. If I can be of help, contact me. 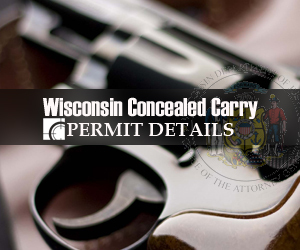 Would a Vietnam Veteran that has been receiving !00% disability for over 30 tears for mental health issues related to delayed stress be permitted to carry a firearm in Wisconsin?